Every dog has their own idea of fun! At Zipidy Do Dog Daycare, each dog has the freedom to have their own idea of fun while participating in our Dog Daycare program! 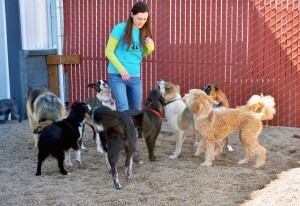 Zipidy Do Dog Daycare is a safe place for your dog to come for exercise, socialization and to build character. We have a large indoor/outdoor area where your dog can run and play off-leash as much as needed to get out all that built up energy! No more coming home, after a full day of work, to a torn up house and a completely energized dog that is ready to run for hours! After leaving dog daycare, your dog will go home tired and be ready for some good, quality bonding time with you while relaxing all evening! We have a great group of dogs and your dog will have the freedom to explore and establish new friendships. A well socialized dog is easier to take out in public and allows your dog to enjoy family time and participate in all the dog-friendly activities around Central Oregon. For the safety of dogs and handlers, all dogs will be evaluated and approved before participating in our dog daycare program. As part of our rules, your dog’s manners and good behavior will be reinforced while attending Zipidy Do Dog Daycare. Dog Daycare is a great program that benefits the whole family! Provide a safe environment for dogs to exercise, socialize, and build character. Provide supervision to maintain a fun and healthy environment for all dogs. Exercise to fit the energy needs from the lazy dog to the crazy dog. Give dogs freedom to explore and establish friendships with other dogs. Stimulate the mind to keep their spirits fresh. Teach dogs rules, manners, and basic behavioral skills. Challenge dogs to be a better dog and behave for their owners. Enhance the dog community in Redmond, Oregon by sharing our practices. Daycare price @ our Resort location is $15 for the day, we do NOT offer “Half day” or “Full day” options from the Resort. We have the same concepts for daycare at our Resort as we do at our Daycare location except dogs participating in daycare at the resort have a scheduled “nap time” from 12pm-3pm so their are times where the dogs are put away in their own kennel for a portion of the day. At our Daycare location we do not have scheduled nap times, they are off leash and free to socialize for as long as they are in our care.